2016 Letter to Fellows from Past-President Peter Carson. Sylvia Fung Chin, the 2017-2018 ACCFL President, discussed her year in office in a letter the College Fellows. She identified the many major events that plagued all Fellows, and informs them of the various activities of the College throughout the past year, along with numerous plans for the future. Here is a link to the major portions of her special communication. The College’s Annual Meeting and Dinner of the College, held at the stately Mount Royal Club in Montreal, was memorable for many reasons, not the least for being the College’s first official gathering beyond the borders of the United States (surely appreciated by the College’s many Canadian Fellows). At the meeting, the College inducted an impressive new class of Fellows, Michael E. Burke (Toronto, ON), Gregory R. Fox (Seattle, WA), Art Gambill (Atlanta, GA), Kyriakoula Hatjikiriakos (Montreal, QC), Tracy A. Kennedy (Grand Forks, ND) Mindy Mora (Miami, FL), Randy P. Orlik (Los Angeles, CA), Janis Penton (Los Angeles, CA) and Michael Ullman (Boca Raton, FL). The College also elected a new class to the Board of Regents Donald G. Bird (Vancouver, BC), Jeremy Friedberg (Owings Mill, MD), Steven N. Kurtz (Sherman Oaks, CA), Vasco Morais (San Francisco, CA) , Janet M. Nadile (New York, NY) and Lawrence Safran (New York, NY) and thanked the departing class of Katherine S. Allen (Louisville, KY), Stuart Ames (Miami, FL), Richard Brown (Charlotte, NC), Edward K. Gross (Washington DC), Malcolm Lindquist (Seattle, WA) and Pauline M. Stevens (Los Angeles, CA). Finally, the College welcomed Pamela J. Martinson (Palo Alto, CA) to the Executive Committee as the College’s new Secretary, and, to dramatic applause, thanked Steven (Carnac the Magnificent) N. Leitess (Owings Mill, MD) for his invaluable service this past year as its President. The Executive Committee of the College for 2016-2017 is comprised of Peter H. Carson (San Francisco, CA) – President, Sylvia Fung Chin (New York, NY) – President-Elect, Penelope L. Christophorou (New York, NY) - Vice President, Norman M. Powell (Wilmington, DE) – Treasurer, Pam Martinson – Secretary, and Steve Leitess - Immediate Past President. After Norm Powell provided a moving eulogy for his, and our, late friend and mentor, and longtime Fellow, Professor Louis F. Del Duca, the College honored Professor Xuan-Thao Nguyen (Indiana University Robert H. McKinney School of Law) with its Grant Gilmore Award, recognizing superior writing in the field of commercial finance law, for her articles “Financing Innovation: Legal Development of Intellectual Property as Security in Financing, 1845-2014”, 48 Ind. L. Rev. 509 (2015), and “In the Name of Patent Stewardship: The Federal Circuit’s Overreach into Commercial Law”, 67 Fla. L. Rev. 127 (2015), and bestowed on Professor Amelia H. Boss (Drexel University Earle Mack School of Law) the College’s highest honor, the Homer Kripke Achievement Award (presented by the ever insightful Professor Charles W. Mooney, Jr. (University of Pennsylvania Law School)). The College’s third annual Fall Dinner and Advanced Seminar will take place in Boston in conjunction with the ABA Business Law Section’s Annual Meeting. The Fall Dinner will be held Saturday evening, September 10 (commencing with a reception at 6:30 pm), at the historic and gracious Algonquin Club, courtesy of Fellow Edwin Smith (Boston, MA). The Advanced Seminar, designed and organized specifically for the Fellows by Professor Daniel S. Kleinberger (Professor Emeritus – Mitchell Hamline School of Law and Reporter, Uniform Law Conference Drafting Committee on the Uniform Limited Liability Company Protected Series Act), will take place the following morning, Sunday, September 11 (9:00 am – 12:30 pm), hosted by Ed Smith and his law firm, Morgan, Lewis & Bockius. The Advanced Seminar, certain to be informative, intellectually probing and entertaining, is entitled “The Intersection of Secured Transactions and the Law Relating to Alternative Business Entities: Selected Issues (LLC Member as an UCC Article 9 Debtor – A Jungian Analysis?)”. The Dinner and the Advanced Seminar will surely be terrific and memorable events – be sure to attend if you possibly can. If you have yet to register, you can do so here. > 2017 Annual Meeting and Dinner in New Orleans (April 8, 2017): The Dinner Committee of Marshall Grodner (Baton Rouge, LA) and Neal J. Kling (New Orleans, LA) promise a true gastronomic treat. > 2017 Fall Dinner and Advanced Seminar in Chicago (September 16-17, 2017): Professor Neil Cohen (Brooklyn School of Law) has agreed, to popular acclaim, to return to cap off his 2015 Advanced Seminar on payment rights as Article 9 collateral and to address choice-of-law rules and other issues arising in cross-border secured transactions. As most Fellows have already discovered, hopefully to their great pleasure (mixed perhaps with a measure of relief), the College has made the momentous changeover to its new attractive, informative and functional website with prominent expanded and new features greatly benefitting the College and all Fellows. I particularly want to thank the Website Committee of Steve Leitess (chair), Peter Carson, Marshall Grodner, Buzz Guida and Pam Martinson and, of course, Marge Snyder and Dan Goldstein of DGA Management Services, the College’s outside administrative service. The trials and tribulations endured have been rewarded with a stunning new website. We urge each of the Fellows to visit the website and spend some time exploring its features and learning more about your College. As you do so, please check and confirm your current contact information in the “Directory of Fellows”, and make any appropriate changes (including uploading your photo, if missing). Please contact Marge or Dan of DGA (at [email protected]) or Pam Martinson, the College’s Secretary (at [email protected]), with any questions or if you need further assistance. There are a number of features of the new website that will continue to be developed and built out to provide expanded benefits to the Fellows, and to other practitioners, scholars, referral sources, clients, prospective clients and other interested persons. Among these is the “Fellows in the News” feature. We would like to populate this website page with many short news items about you and the other Fellows so that we all can be informed of, and take pride in, notable changes and events in the course of our collective professional lives. We are a remarkably collegial College, and staying in touch through the “Fellows in the News” is a key means to further that important value. Please forward any news items relating to yourself or other Fellows that you think may be of interest, including any articles, client alerts or other publically available writings written by any of our Fellows, to Marshall Grodner, our website content chair, at [email protected]. 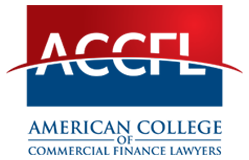 The History of the American College of Commercial Finance Lawyers, an effort that spanned more than four years and countless hours of locating, retrieving, culling and reviewing archival materials, relating and recording anecdotal recollections, and then drafting, re-drafting, editing and re-editing the work itself, has been completed and is now posted and available for reading and downloading on the College website (at History of the College). I would like to thank all those who contributed to this important archival record, including (and with apologies to those inadvertently omitted) and in no intended order, Christopher Rockers (Kansas City, MO), Lynn Soukup (Washington DC), Howard Darmstadter (Stamford, CT), Professor Daniel Webster, Maury Poscover (St. Louis, MO), David Willenzik (New Orleans, LA), Edward Dobbs (Atlanta, GA), Ed Smith, Bruce Schimberg (Tucson, AZ), Carolan Berkley (Philadelphia, PA), Bob Zadek (San Francisco, CA) , Leonard Gilbert (Tampa, FL), Thomas Welsh (Hartford, CT), Kenneth Greene (Greensboro, NC), Earl Leitess (Owings Mill, MD), Professor Stephen Sepinuck (Gonzaga School of Law), Steve Leitess, Leianne Crittenden (Redwood City, CA), Sylvia Chin, Lee Powar (Cleveland, OH) and Steven O. Weise (Los Angeles, CA). The Fellows of the College are experts in most every aspect of commercial finance law and of commercial law more broadly. It is not at all surprising that our colleagues (and perhaps you, the reader of this Letter) feature as reporters, study and/or drafting committee members and advisors to important drafting projects of the Uniform Law Commission, the American Bar Association, the American Law Institute, UNCITRAL, the Working Group on Legal Opinions and other prominent law reform organizations and have played an instrumental role in the development and improvement of the field of commercial law. The College is increasingly playing a separate but important role by appointing its own official College Observers to these drafting projects. The Observers, on behalf of the College, participate in the project meetings and lend their considerable talents, experience and wisdom to the process. There usually will be upwards of ten separate important projects ongoing at any time with a College appointed Observer. For a description of currently ongoing projects, click here. A wonderful benefit to the Fellows is that the College regularly hosts conference calls open to all Fellows on which a College Observer will update the Fellows as to progress and developments in his or her project, and makes available current drafts and other project materials. Since the Annual Meeting in Montreal, the College has hosted Observer calls on the Uniform Law Commission’s Virtual Currency project (Pam Martinson) and the ABA Business Law Section’s Model Intellectual Property Security Agreement project (Kathi Allen and Howard Darmstadter) and Sylvia Chin arranged for the College to participate in two Working Group on Legal Opinion webinars. Our objective is to continue to host Observer conference calls at the pace of approximately once a month. For a description of scheduled future calls as well as a description of past calls and a link to provided materials, click here. An important contribution that Fellows can make to the work of the College is to participate on one of the College’s committees. Thank you all Fellows who have agreed to serve on a committee for the 2016-2017 year. In addition to the Executive Committee, the 2016 Fall Dinner Committee, the 2017 Annual Dinner Committee and the Website Committee (see above), these are the Fellows Nominating Committee (chaired by Tom Hemmendinger), the Regents Nominating Committee (chaired by Barbara Goodstein (New York, NY)), the Officers Nominating Committee (chaired by Steve Leitess), Special Service/Homer Kripke Award Committee (chaired by Steve Leitess) and Grant Gilmore Award Committee (chaired by Professor Juliet Moringiello (Widener University School of Law)). For a listing of all committees and their members, click here. The Board of Regents is, in truth, the board of trustees or directors of the College. Important steps are being taken to increase the involvement and oversight role of the Regents, which we think will enhance the honor and rewarding experience of serving as a Regent of the College. Among other changes, the Board of Regents will be meeting four times during the current College year, twice by phone and twice in-person (in conjunction with the 2016 Fall Dinner and Advanced Seminar and the 2017 Annual Dinner and Meeting). The Board held a conference call meeting last week, on July 28. The second conference call meeting is currently scheduled for February 23, 2017, at 4:00 pm ET. An ongoing project, that received its impetus from the strategic planning undertaken in 2012-2013, has been to update and to amend and restate the College’s bylaws. This task force has been chaired by Stuart Ames, and also consists of Jerry Grossman (San Diego, CA), Lynn Soukup and me. We anticipate having a final draft of the amended and restated bylaws available for the Board of Regents to consider at the 2016 Fall Dinner meeting. Lastly, a favorite topic for all Fellows - annual dues. It is the case that the current bylaws of the College provide that the dues notice for any fiscal year (the College is on a calendar fiscal year) is to be sent out promptly following the Annual Meeting of the preceding year (by way of example, the dues notice for 2017 should have been sent out following the 2016 Annual Meeting in Montreal). Needless to say, that has not been the historical practice of the College. Through the diligent efforts of successive Executive Committees (particular credit should be given to Sylvia Chin), the dues process has improved immensely. With our transition to the new website and its improved functionality, we have the opportunity to move to an operationally easier, more predictable, and more accountable dues billing process. Commencing with the dues for fiscal year 2017, dues will be billed in early December of the preceding year, with reminders to follow. This way, we hope to have collected the annual dues early in the year, which will greatly aid the budgeting process. The bylaws will be revised to reflect this change so that the College should be compliant going forward. Many thanks for your patience and understanding during this transition, but it will work better for all of us. On behalf of the Executive Committee and the Board of Regents, thank you for your commitment to the College. We sincerely hope that the fellowship and the services that the College affords is of great value to you, professionally and beyond. Please feel free to reach out to me or any of the other members of the Executive Committee if you have any questions or if we can be of help.